What in the world has gotten into Jack Hannahan? And how can the Indians make sure the rest of the team catches it? 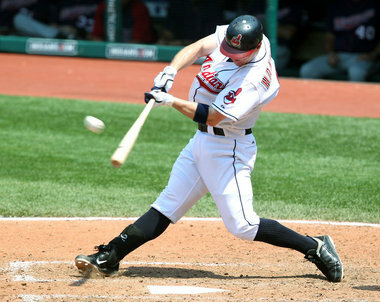 After homering in the second and again in the sixth inning Wednesday night against Oakland, and driving in the game-winning run in the 16th inning, Hannahan is hitting .444 (16-for-36) with three home runs and 11 RBI on the Tribe’s current homestand. Whatever Hannahan is doing is working, we just wish he could pass it on the rest of the lineup. Despite rumors that Arsenal was targeting American Clint Dempsey it looks like Dempsey is staying at Fulham as the transfer window has closed for now. Not to bag on Fulham or Craven Cottage, but it would have been nice to see Dempsey have a chance on a bigger stage that, despite its early season woes, Arsenal can provide. Ever wonder what footwear Katie Whitham keeps in her black shoulder bag? Then head over to Waiting for Next Year for an interview with the sideline reporter for SportsTime Ohio at Tribe games. All kidding aside, it’s a really good read. Check it out. I'm glad I stayed-up to see Hammerin' Hank win the game… though, I was sure he was gonna hit his 3rd bomb to do it. Still just as good, but I'm really tired right now.